I mentioned a short while back that Madan Mohan made one of my favourite Bollywood albums. Here it is; not the most consistent soundtrack I own, but featuring two tracks that both fall into the 'stop whatever you're doing' category. Mohd. Rafi's 'Tum Jo Mil Gaye Ho' is a stunning, psychedelic marvel of a song. 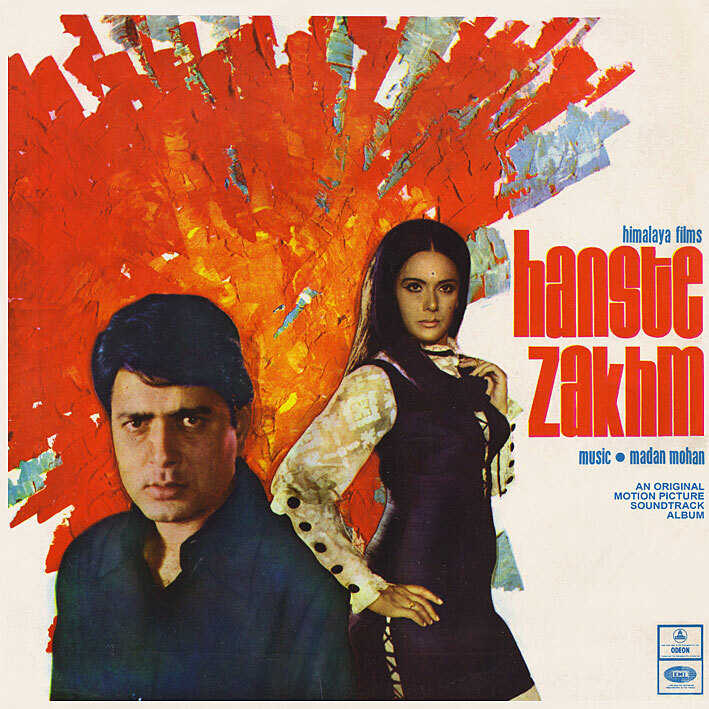 Weird, shifting melodies, swirling violins, tight drums, thunder crashes and frenzied interludes are all contained within its 8 minutes of magic, with a picturization that makes 'Hanste Zakhm' look like a luridly coloured nouvelle vague film (Hindi style). Which I'm pretty sure it's not, but I do for once want to see it. Fantastic stuff... yet arguably eclipsed by the second highlight of this score, 'Aaj Socha To Ansoo Bhar Aaye'. I can't even begin to describe it... slow burning, haunting, stirring, mind-bending, a thing of otherworldly beauty... Lata Mangeshkar's trippiest, and certainly among my 2-3 favourite Bollywood songs. The rest are essentially also-rans... not bad, but nothing much in comparison. Doesn't matter. These two tracks more than make 'Hanste Zakhm' an indispensable album. WOW - this is a great soundtrack and also one of my favourites. I have always loved the 'Aaj sochaa ...' song by Lata. She has never sounded better and the song is a masterpiece. I recall seeing the film when I was a kid. Can't remember anything about it aside from a majoe spoiler so I guess I can't post that here. As far as I remember the film was popular but this may have been because of the three main songs - Tum jo mil gaye ho, Betaab dil ki tamanna and Aaj sochaa to yeh aansoo. Great post! Cool, thanks. Do you know anything about him? Second link is google cache as the original link is not working. Thanks for this, PC---and Merry Christmas/Happy New Year to you! have this one cassette, so glad you posted it.... Tum Jo Mil Gaye Ho is one of my all time favorites.. There is a lot on Kersi Lord on the net. But here is the gist--Lord was the son of Kawas Lord, a senior music arranger for many, including Naushad. Lord himself learnt classical piano and then began playing many instruments for music directors as diverse as Naushad and R D Burman. The link to the title music expired again :( could you please re-up? Oddly, I can't seem to find it in my iTunes library... anyone else (who's already downloaded) fancy uploading it here?